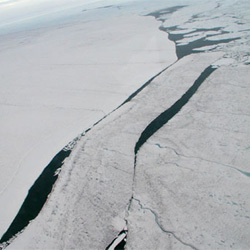 The shifting of the ice has also led to potential disputes over Arctic sovereignty rights, an increasing consideration for countries that hope to tap natural resources that may become exposed by the melting ice. The Canadian expedition was part of an effort to determine territory in a changing terrain, as the different nations who lay claim to the Arctic try to solve the melting jigsaw puzzle the Arctic's ice has become. What is not in dispute: The ice is collapsing.